Former players, experts and other stakeholders have adressed the problem of match-fixing in football during the Play The Game conference, but we are yet to hear from the key part of a football match. The referee. Peter Mikkelsen, a former international top referee named world’s best referee in 1991 and 1993 and member of FIFA’s referee committee, is happy that the referees aren’t present. “It’s good, because it means match-fixing isn’t a big problem for us,” the Dane claims. In 2005 Robert Hoyzer, a german referee, was the center of a big match-fixing scandal. But that’s a quite rare situation, according to Mikkelsen. “Of course we will act, if there’s a problem. The referees are not professional as the players are and they have civilian jobs. 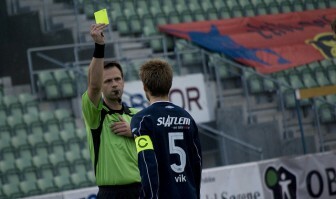 I think, that’s why we don’t see referees fixing matches,” says Mikkelsen. Mikkelsen has never experienced match-fixing in the many, many games he refereed. He does mention a situation in Portugal in a match between a local side and Tottenham Hotspur. The home team were putting Mikkelsen in situations that were ideal for a match-fixing referee.